It’s hard to believe your seven years old today! 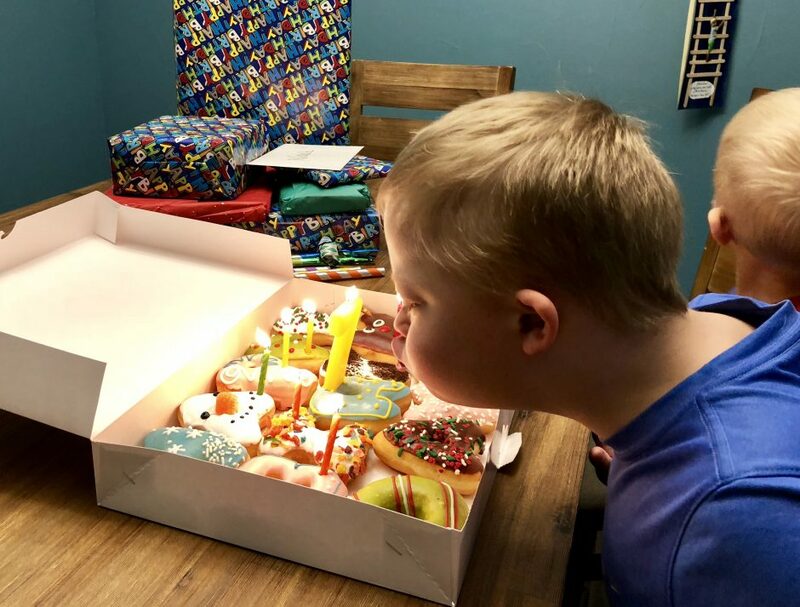 I can remember in vivid detail the moment I heard our pediatrician say those words, “he has features consistent with Trisomy 21.” I had no idea what life was going to be like raising a child with Down syndrome. I was a new parent. I had no idea how to be a parent, much less a parent of a child with special needs. I don’t think I had ever met a person with Down syndrome before I met you. I was scared. I was fearful. I was worried. I was sad. I was surprised. I had a mix of emotions. If I had a time machine I’d go back in time and tell myself that all of that worrying was in vain. I can honestly say these past seven years have been the best seven years of my life. I’m so proud of the (not) so little boy you have become. You work (and have worked) to hit all of your milestones. You’ve spent countless hours at various therapies working hard to do what comes naturally to most other kids. I remember watching you trying to take steps on a treadmill as a tiny little boy, just waiting for you to walk on your own. Now, our problem isn’t that you can’t walk, it’s that you can….fast…so fast that we have to keep a constant eye on you to make sure you don’t run away when we’re out and about. I love watching how the other kids treat you at school. 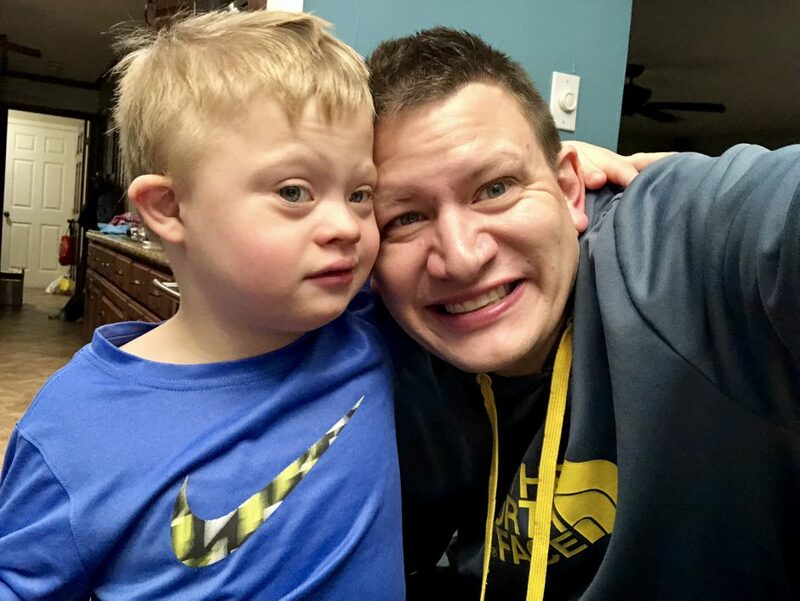 They don’t view you as “the kid with Down syndrome,” but as their friend. They are kind to you. They play with you. They love you. I love how you fit right in. Sure, you can’t talk as well as they do, or do all of the same the things that they can do, but you never skip a beat. You jump right in with and try your hardest to keep up. I love that about you. Noah, your joy is contagious. I love your smile, your hugs, and the way you love to sing and dance. 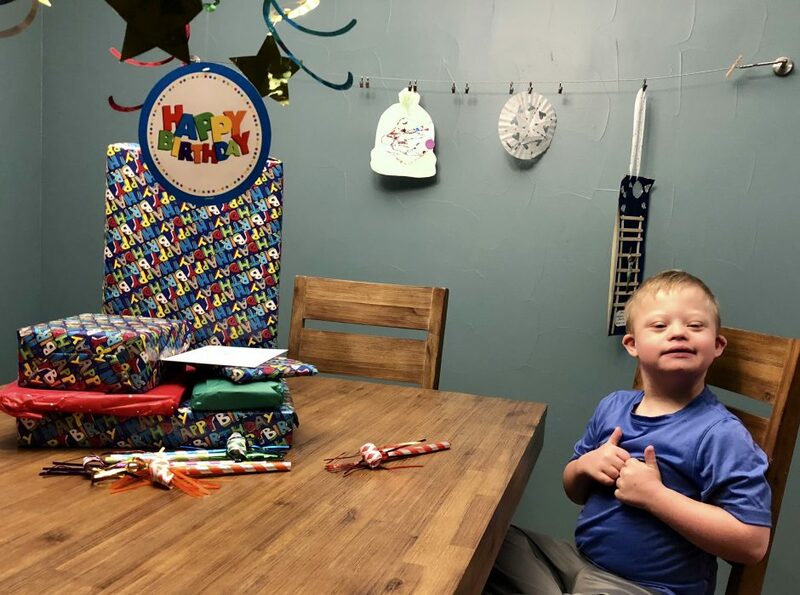 I love watching how much joy you get out of having people sing Happy Birthday to you, how much you enjoy blowing out candles, and how much fun you have ripping into the wrapping paper of your gifts. It’s a ton of fun watching you play with your brothers. You’re such a great big brother, and you’re going to teach them lessons about life that they wouldn’t be able to learn if they didn’t have a brother like you. There are no words to adequately describe how proud I am of you. It gives me so much joy to be your dad. Noah, you’re a gift to our family. I hope you have the best 7th birthday ever. 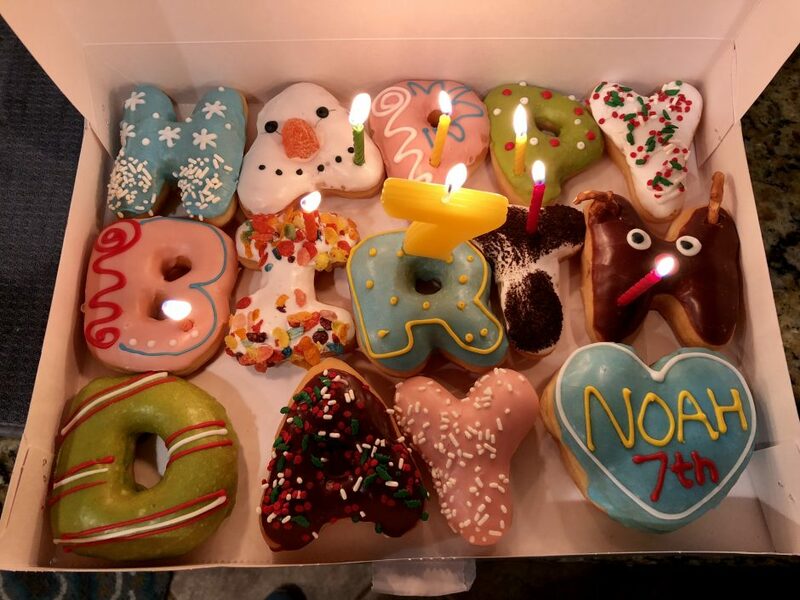 Love Noah’s Special Cupcake Birthday Donuts. He is so adorable & seems very happy. So much love & well taken care of. A Special Gift chosen just for your family. Happy 7th Birthday Noah, I love following your story on Facebook, and watching you grow up into a handsome young man. You are a true gift from God, and are loved so much by Him, and a multitude of others, myself included. I pray this birthday will be filled to the brim, with lots of wonderful surprises. Please give all of your family a BIG hug, from me. Merry Christmas, and Happy New Year also. Hi! Thanks for your comment and your kind words. Every good thing in my life is a direct result of God’s goodness in it, that’s for sure! Thanks for your comment and for the kind words! It’s great hearing from friends all the way in Scotland…how awesome! Thanks for your comment, and for the kind words! Hey Chad, thanks for the comment! Keep us posted on Braydon’s life and progress!! What a beautiful letter. I have followed Noah since he was very small. You and your wife are amazing parents. It is very obvious how deeply you love your son. He is amazing!!! As always, this site is an encouragement to men like me. I read each post, and there is something I glean and it helps. I am exceptionally grateful for your family. 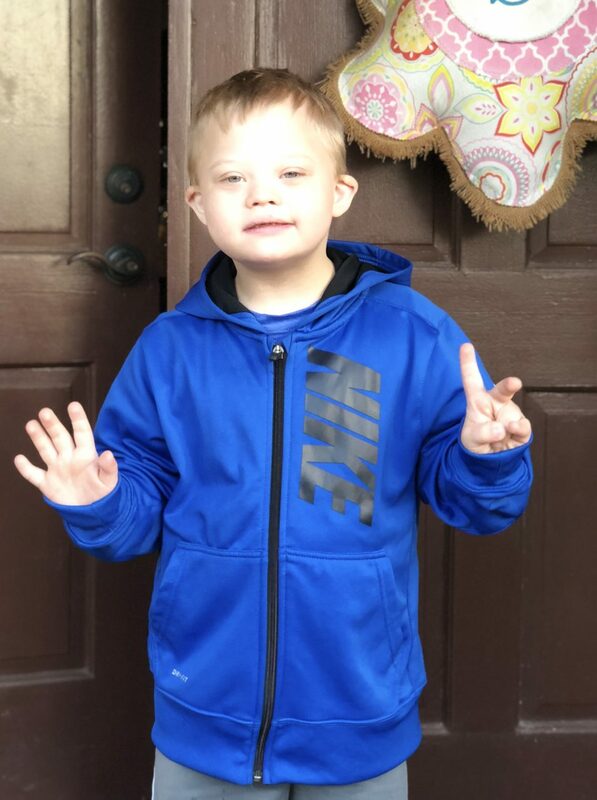 I can not believe Noah is 7!!!! Crazy how fast life has moved. Happy Birthday Noah. You are loved by more people than you will ever know! Thanks for your constant encouragement over the years! I hope you and your family are doing well. Merry Christmas to you all!